When working in China, usually foreign people will work full time, so meaning 20+ hours per week. Part timers, who usually study too, work around 10-15 hours per week. At the moment I’m working about 10. I’ve been doing some calculations, and surprisingly, I’m earning more in 10 hours in China, than if I work 20 hours in Ireland. Say for example, in China; 1 one hour class you might earn 100yuan. (and this is a low payment). In Ireland, the minimum wage is 8.65euro. At todays exchange rate, 100yuan = 14.51euro. There’s a big difference between 8.65 and 14.51! I know when you add it up the wage at home will be higher, but 100 yuan is a very slow wage, so expect that to be much higher. So basically, I’m working 10 hours less than home, but my hourly wage is much higher. Pretty good deal, especially in China, where everything is much cheaper too. So if you’re wondering if you will make some money in China, you will. Add to the fact that for private students you can charge sometimes 300+ yuan per class. 43.55euro for one class isn’t too shabby! Living in China isn’t all that bad! 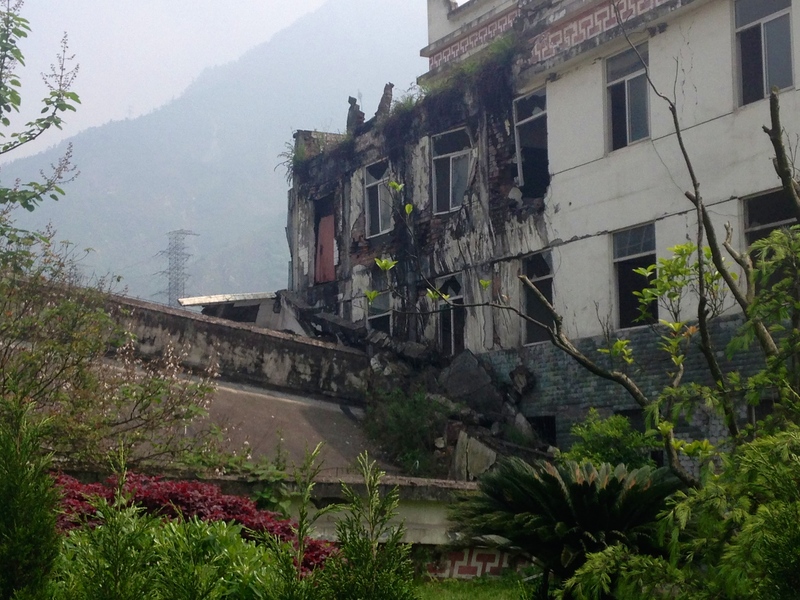 Taoping Village & the Wenchuan earthquake, 2008. I’ve just arrived back from a wonderful small trip. I took two days off work for it, for good reason; it only cost m 150yuan. Or about 22euro. For this, it included: 1 breakfast, 2 lunches, 1 dinner, transport, accommodation for 1 night and two entrance tickets to a village and a town. All that!! So of course, I really couldn’t let that deal pass. It was supposed to be about 390 yuan, but the Uni paid the rest. So it was great value. We left Friday morning at 8:40 and headed north west and out of Chengdu. Here, there are no cities, no tall buildings, much less pollution, and not many people. Oh and plenty of mountains. Chengdu has literally no mountains. So we headed to a village called Taoping. 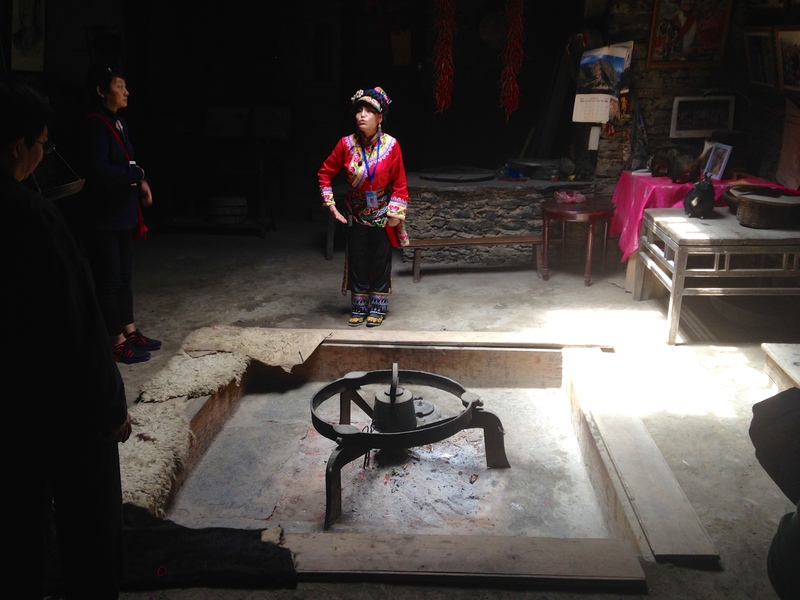 it belongs to the Qiang people, a small ethnic group in China. It has a history of over 2000 years. I think the architecture is beautiful, very unique. The visitor site heading to the village. Inside one of the houses, they would put on a big fire. 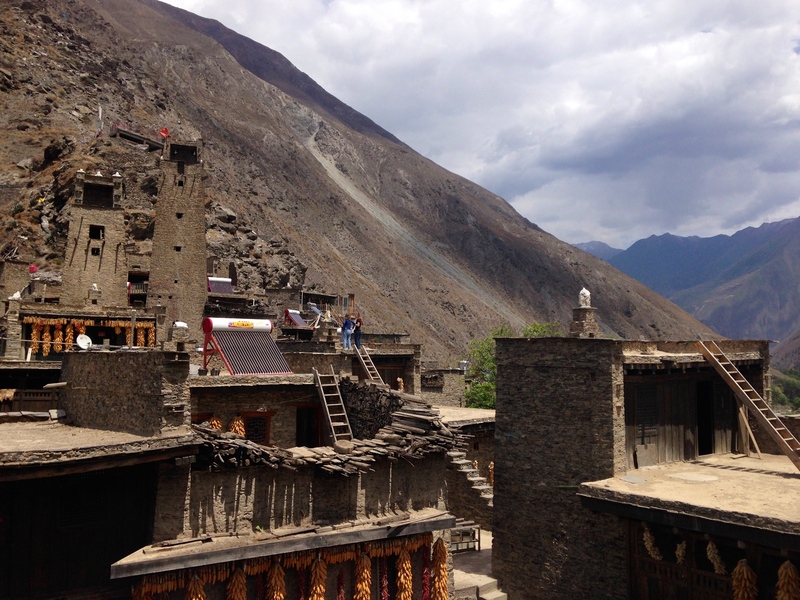 A beautiful view of the surrounding area. 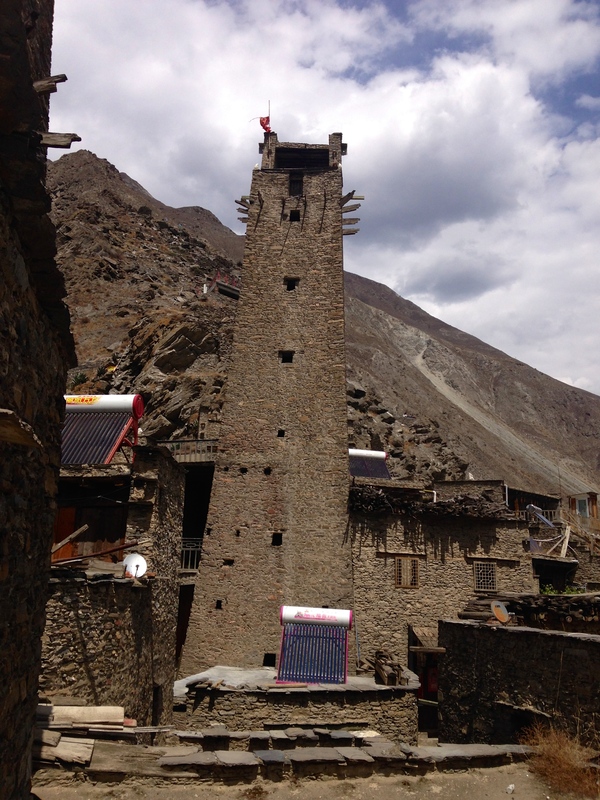 The two watchtowers on the left. After that, we travelled to another small town to our hotel, where we stayed there for the night. 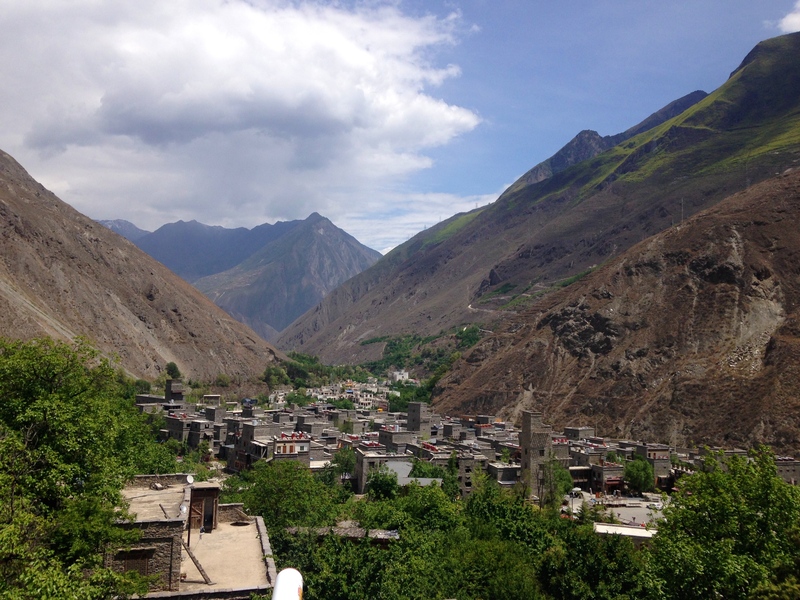 The next day we headed to a town called Wenchuan. People may be familiar with this name. 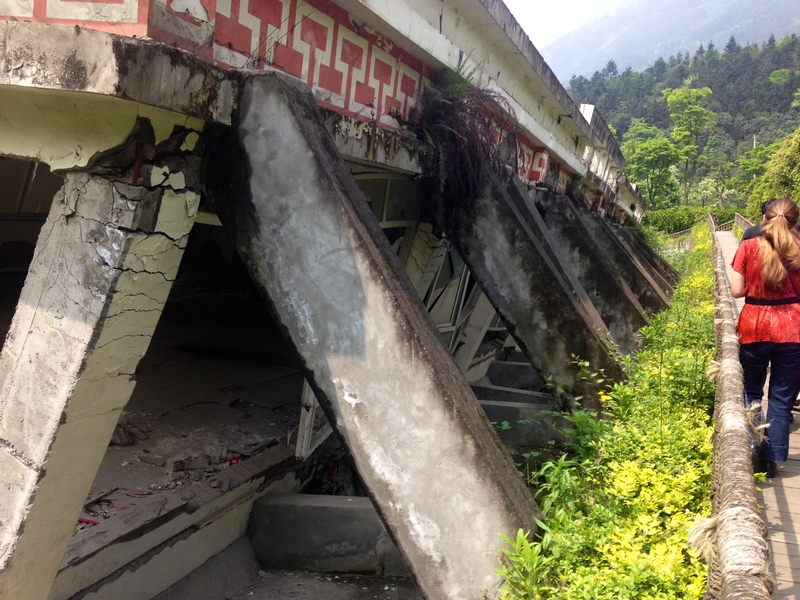 This was where the terrible 2008 earthquake hit Sichuan. Wenchuan was really badly hit. There were about 12,000 people before it. And after, there were about 6,000 people. The town was literally destroyed. 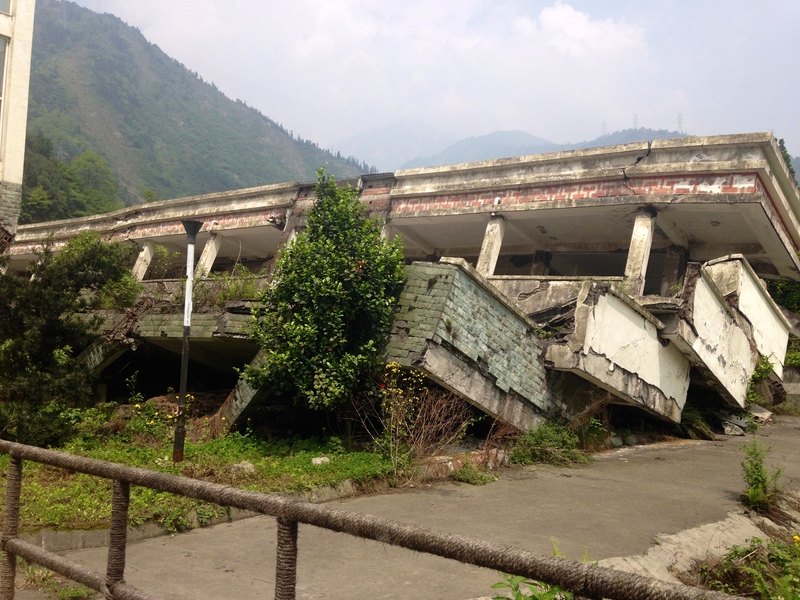 When we visited everything has been rebuilt again, but they decided to leave a high school untouched after the disaster. 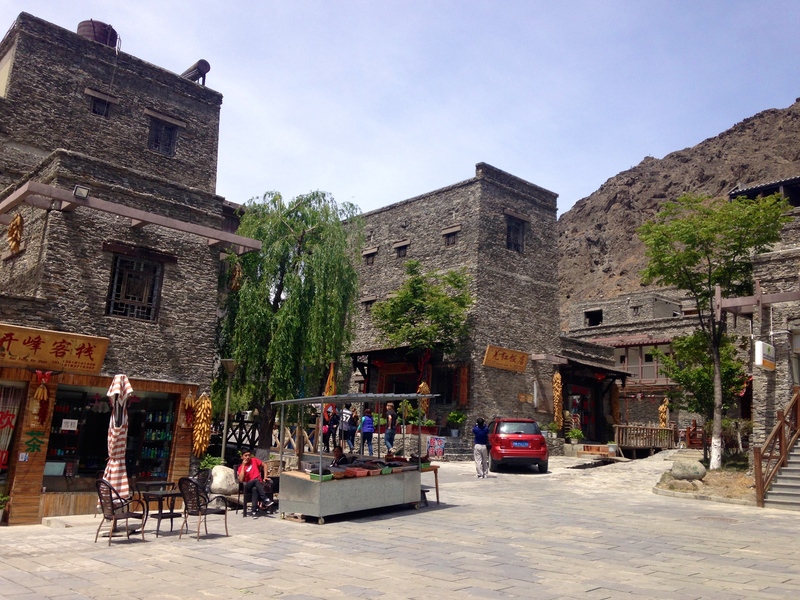 Now it is a tourist site Before the earthquake, the town was mainly an agricultural town, but nowadays it deals with tourism. 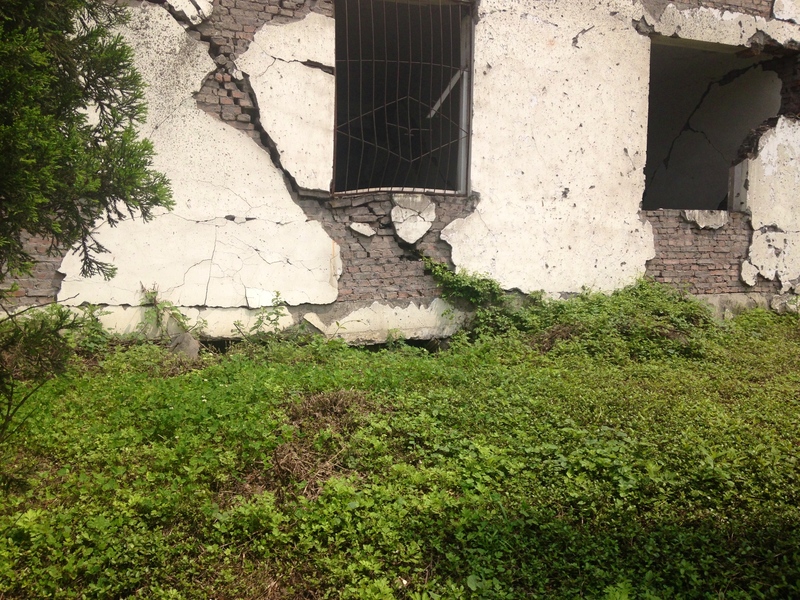 The front building where many of the students where at the time of the earthquake. 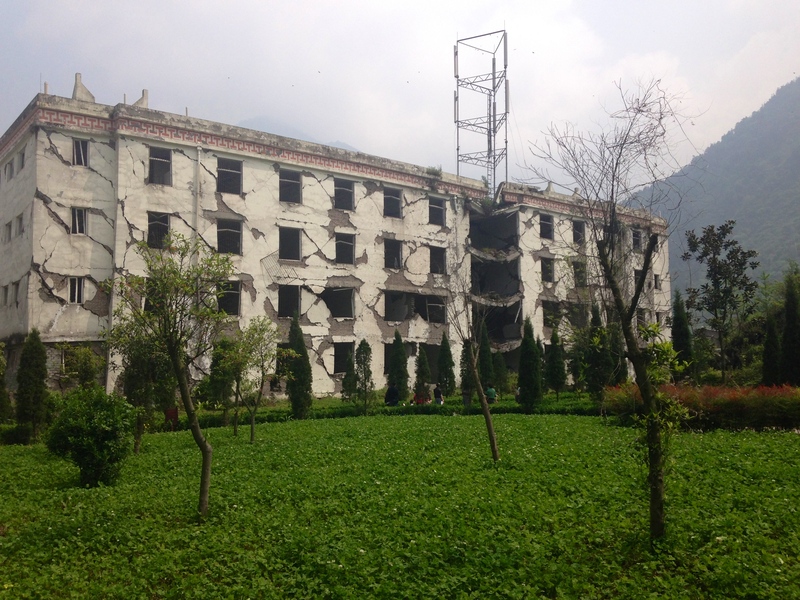 This front building was where many of the students where, and a lot of them died here. 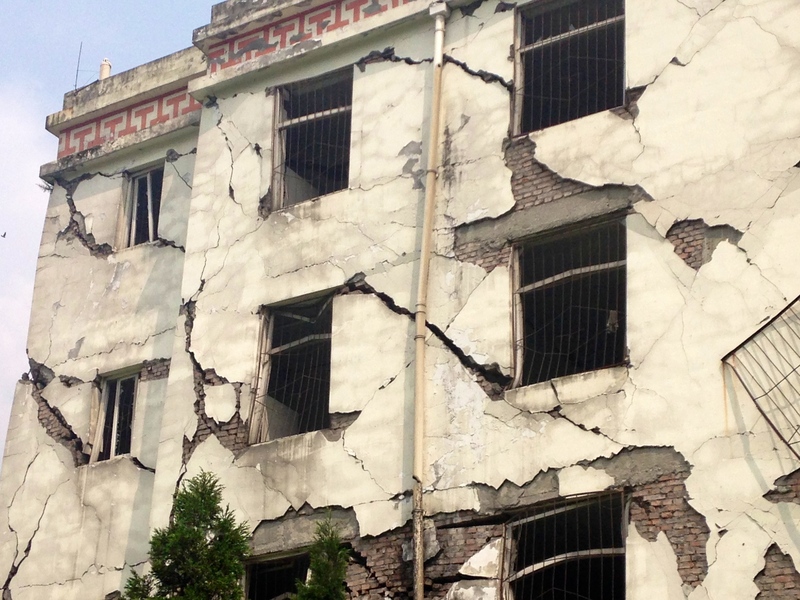 This was a 5 floor building that was used as classrooms. Some bodies still remain underneath as they couldn’t retrieve them. 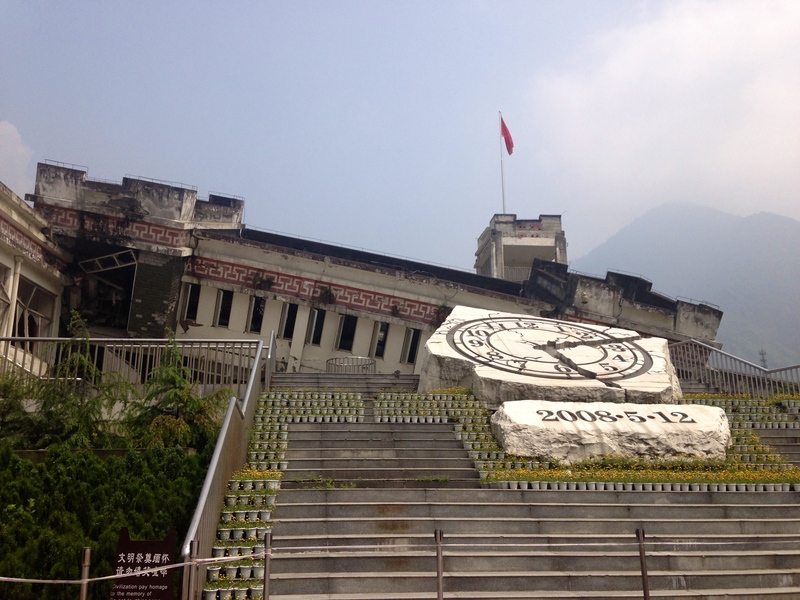 The clock shows the time when the earthquake hit, 2:28pm. This was when the students would have been in class. Do you see how the steel railings are curved as the building collapsed onto it. We were wondering were the railings put there after the earthquake, but we quickly realised that they were there when it happened. 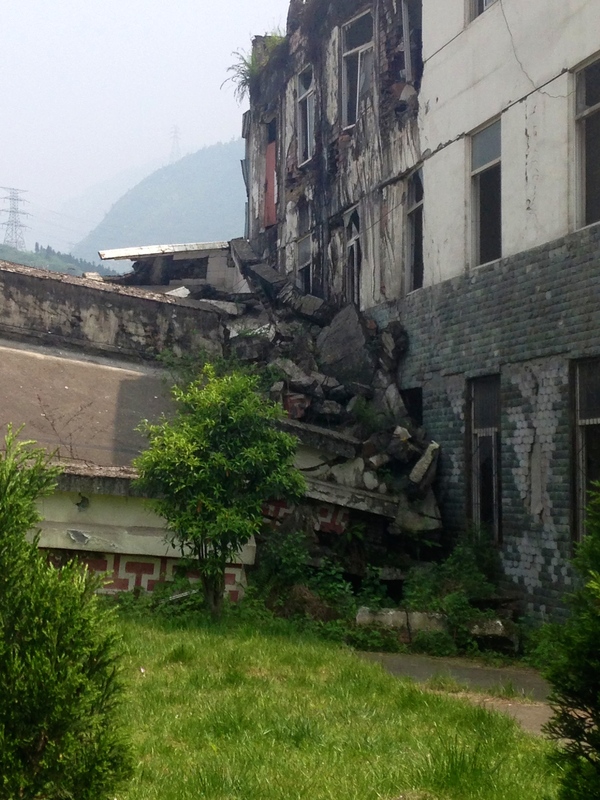 The stairs on the right show where the building fell from. 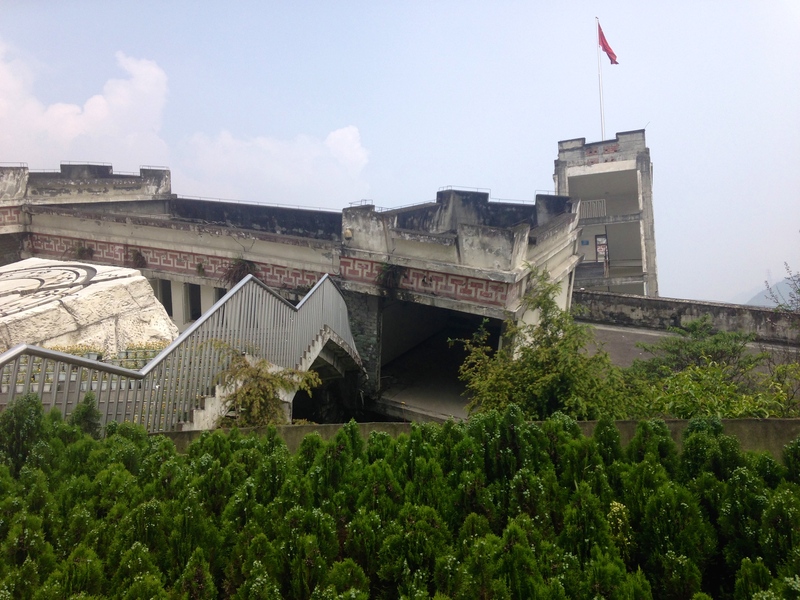 This was the main escape route for the students, and it has withstood the earthquake. 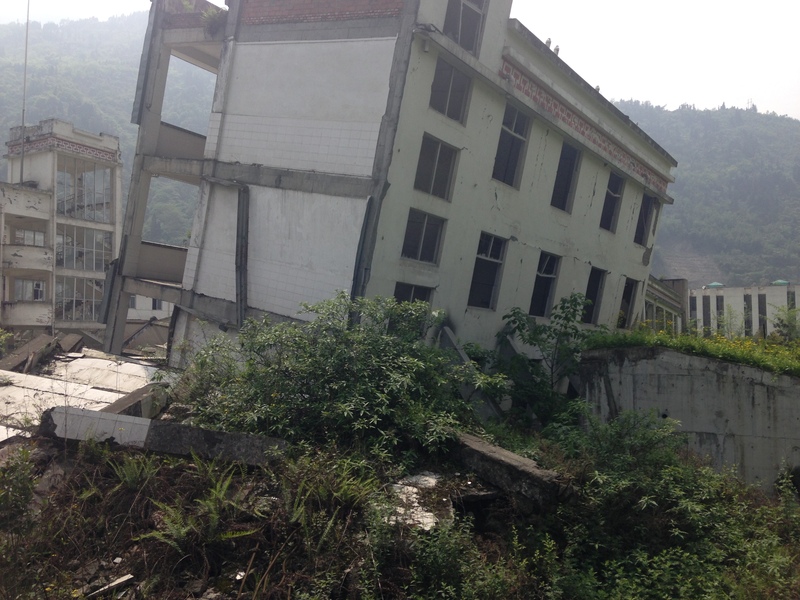 The front building grazed this one as it fell. 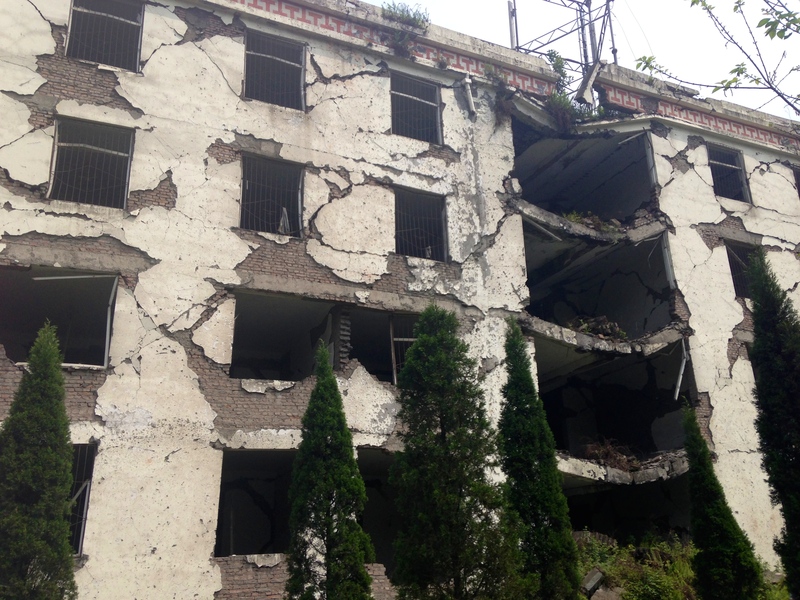 When I saw this second building I thought ‘wow this one wasn’t as badly damaged’. Then the guide told us that it actually has 5 floors and not 4. The first floor collapsed from the weight of the top 4. Sadly, there was a male student that was killed here. He was the only student there. He was on the 3rd floor but went down to the first to escape. It’s there, when the floor collapsed. His body is still there as again, they couldn’t retrieve it. You can just about see the rim of the first floor window at grass level. The stairway from the first building. 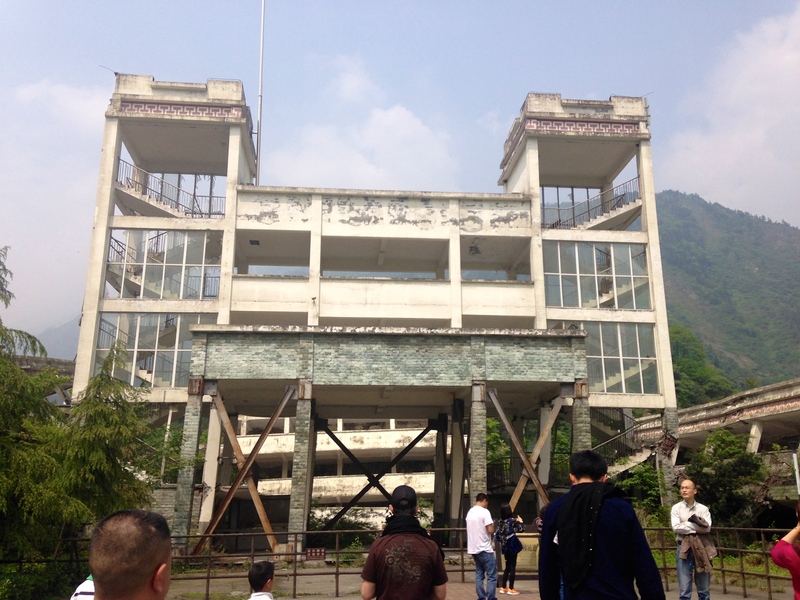 After the earthquake, the people wanted to preserve this, so they erected the steel pillars so they will keep the building steady. On the right, you can see that the green pillar from the original building has been damaged, you can see the bars.I’m sure it would fall down easily! This third building, there was a class going on. When It happened, their teacher held the door up for them so that his students could escape. Sadly he died (body not recovered), and his little baby died also in the earthquake. They built these so the building wouldn’t fall completely. From what our tour guide said, this area didn’t actually have as many victims! This was one of the places that had the least, which I was surprised about. If this is the damage from one area, I can only imagine the catastrophic damage seen throughout the small town. When I saw the school, it reminded me of Orlando Studios. I visited when I was young, but we have videos. In it, there is a clip when we were queuing for the ride ‘Twister’, you know, that old film about a twister in America. I remember they made the buildings, outside the attraction, to be damaged, lob-sided and of course, like a twister had hit it. And then I see the real thing here. It was extremely eye opening, how so much damage can be caused. 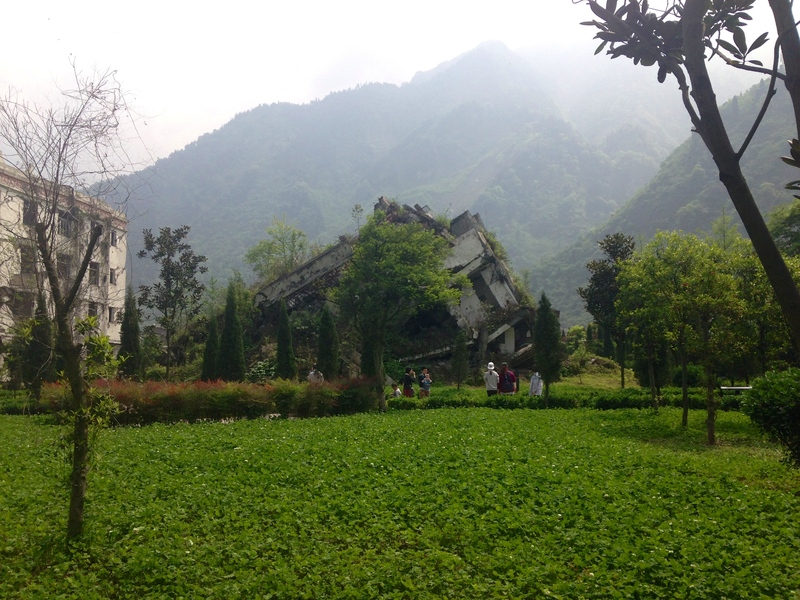 Now when I hear of an earthquake that’s just happened, I’ll remember back to when I visited Wenchuan, and how deadly and catastrophic they can be. After having a lovely few weeks having no work during the weekdays, and generally lazing about in the apartment, I’ve finally started back teaching. I work with Rafa in his campus Monday, Tuesday and Friday. On Saturday I work in my old campus. I’ve only worked in the new campus for two days and I was wrecked each night! Plus having to get up at 7:30 for class doesn’t help either. We’ve been ‘forced’ to take naps between Uni and work time; by 2pm I’m ready to hit the bed, and could easily stay there for 2/3 hours. But one hour will have to do, then head to work. I have to cover classes until the other teacher comes back, in about 2 months time. But I think for the next semester in September I’m going to cut down my days by one. Maybe I’ll work Saturday, Monday and Tuesday. Getting up early has me shattered! I haven’t gotten up this early since my Uni days over 2 years ago, so It’s a shock to the system. Plus, nearly every morning I wake up I’m tired; maybe I’m not getting to bed early enough. Last week we had a very busy week where we were invited to here, there and everywhere. That meant some late nights! In the morning I could really notice how the lack of sleep affected me. Ha I’m getting too old for these late nights! As for work, and for the new kids, ( I haven’t met them all) they seem nice. However one boy aged 7, cried 5 minutes into the class. Apparently he doesn’t like loosing in games and he’s extremely sensitive. The first thing I played was a game and guess who lost. Why no one bothered to tell me what he’s like, god knows why, as he has cried many times before. So not a good start to that class. And all these kids love the letter J! I have about 6 kids with their name starting with that letter! I’m getting so confused with them all! So work is keeping me busy and my Chinese; well, thats keeping me extra busy. Not surprisingly, Rafa is flying away, leaving me in the dust. At the moment I’m trying to learn 10 characters a day, as I’ve been having trouble with remembering them. It’s now that I look back fondly during my time studying French… Sigh. Yet, I am really enjoying it, and everyone is in the same boat as myself so it’s quite alright to make many, MANY mistakes! And tomorrow, we are heading on a little trip the Uni organised for us to a village a few hours away from Chengdu. We’ll be staying there for a night then heading home on Saturday, so I will post some pictures of that! Everywhere you go in Chengdu, there are people. Everywhere. Because it was a nice day, we decided to cycle to a park. It being a Sunday, I knew that it would be busy. But in my head, I’m still thinking from my point of view that I’m at home. Coming from a town with just over 35,000 people, to a city with around 14 million; you would think I’d have copped on by now that NOWHERE in my Chengdu will be quiet. We arrive at the park… and sure enough its busy. People were walking here, there, sitting on any available bench. Because it was Sunday, families were out together. It was nice to see the Chinese families together, but if only it was a little more quiet! You can’t go anywhere in Chengdu but people will be there. In my hometown, if you go somewhere during the day time, when a lot of people are working, you know it’s going to be quiet. Shopping during the day is a great time to go because you know everyone will be at work and the kids will be at school. Not in China though. We visited IKEA a couple of weeks ago, on a Wednesday at around 1:30pm. I thought ‘yeah it’ll be quiet seeing that its a Wednesday’ Wrong. As per usual, there were loads of people in it. I know there are many many cities and countries like this, I grew up in a small town, so before I came to China I’ve never experienced living in such a big city, never mind such a big country like China! I suppose I miss the tranquility of Ireland sometimes. Being able to walk somewhere and it is quiet and peaceful. Visiting a park and being able to actually sit on a bench without having to hunt one down, pouncing on it before some other Chinese person does. 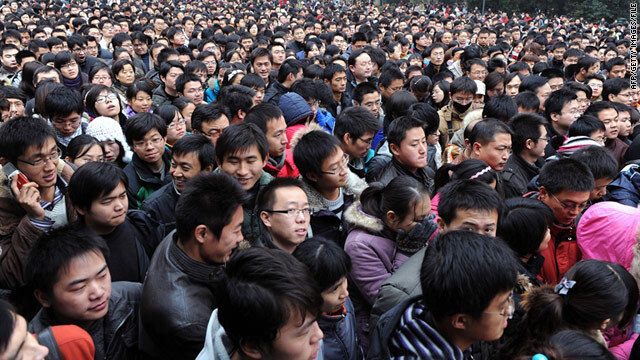 China is a noisy country, and Chinese people are noisy I might add. If you’ve want to experience this, go to a Hot Pot restaurant. I can’t wait to go home and enjoy the peace and quiet for a few weeks. They didn’t give me my passport. The title says it all. My passport has been denied from me. I go there, give the lady my receipt, she says ‘go to counter 10’. Once she said that I knew I wasn’t getting it, usually she has them in her big cabinet beside her, and when I got my visa the first time I got it from this counter. So now I thought, ‘aw that’s it, its been denied….’ That happened a fella from Uni. So I go to counter 10, gave the lady my receipt and the oh so important original, and stamped documents that I needed the last time, and she’s goes on the computer. ‘Uhh? ?’ she said. ‘Thats not good’ I thought. She leaves into another room. So I’m waiting for about 10-15 minutes, getting a little anxious, while another foreigner comes and sits at the next counter. I know he’s in the same situation as myself. A man comes out and asks me when did I give the new documents, in which I replied just now, to the other lady. Away he goes, to come back, with no passport for either myself or the other person, and says that we have to come back on Wednesday to pick it up. At this stage, the other man, who by our conversation told me he was from Switzerland, started getting angry and demanding why. Because I left my documents in late, and his, his medical examination, we can’t get them today. Yes, they have the passports there and ready, but because we didn’t give all the documents in, we’re being denied them. So, that means ANOTHER trip back up to collect it. But Rafael has to collect his on Wednesday too so at least I’ll have company. This time, they better give it back to me! So, over 2 weeks have passed since I got the English job, but, surprisingly I haven’t had one class with the new company. I was to wait until they get students for me on the days that I was going to work with them, but unfortunately, the parents mothers don’t want to change teachers. I was left waiting, and waiting, until I was hoping to get a text saying they have students for me. So, with no income coming in, apart from my private student and my job on Saturday, I contacted them to ask them what was happening. They said they have no students for me, and if I want to get another job and let them know what days i’m free, they ‘may’ have students then. What turned out to be a great job; great location, good money, times that I wanted to work…. nothing came from it. I suppose I’m more disappointed by the fact that it seemed like a good job. I was promised all these wonderful things, and instead I’m left twiddling my thumbs and having no money. It was one of my first interviews where my teaching skill got me a job. They liked what they saw. I was chosen out of loads of people for it because of my teaching ability… and then theres no work for me. Thats the most disappointing thing about it. Our trip to Ireland is coming up shortly and that was the main reason for working, saving for that. The money I’m getting at the moment is next to nothing, so I’m trying not to spend any money. By this tactic, staying at home all day. I know, it’s sad, but my thinking is, ‘If I go outside I’ll spend money, I’ll stay in the apartment so that means I wont have to spend any’ .Plus, the only real constructive thing to do at home is to either clean the apartment (I’d rather not) or study Chinese, so I suppose my Chinese is thanking me. I’ve even starting cooking!!! Veg and potatoes are much cheaper than eating out, so to save more money I’ve been cooking for myself and my boyfriend for when he comes home from work. I’m becoming a housewife. But, when 5 potatoes are only 40cent, I’ll make the effort instead of eating out. The potatoes are sometimes hard, but it’s the thought that counts! Not only are we saving for Ireland, our plan is also to visit Paris, where my boyfriend’s sister lives so he can visit her…. so visiting Ireland AND Paris will not be cheap! But, there is temporary light appearing; in Rafael’s campus there is a teacher who has to go home for a month or more, so they asked me could I cover some of his classes for that time. Hopefully that’ll work out and I’ll be able to save a little more money. I’m also trying to sort out, when that temporary teaching is finished, how I should organise my work schedule. It’s just I don’t want to teach English 4 days a week. I enjoy teaching it with students I like, but my mind is still nagging me saying ‘this isn’t what I want to do’. It’s not. It’s just a means of getting income. Plus, having Chinese in the mornings and then studying, I don’t really want to work that many days. And, the ongoing question of what I want to do with my life keeps cropping up. I’m 25 now. Time isn’t slowing down for me. Aged 22, grand, still have plenty of time. But at 25, I think you need to have, to some degree, something to work with, at least some practical experience for what you plan to do with your life. Well, thats my opinion anyway. I’ve said in my previous posts, I want to do something with travel, a tour guide or something. Relations with Ireland and China. Something to do with Ireland and tourism. Even when I think of it I get excited, a sudden surge of pride for Ireland. You know that feeling you get when you think of your ideaI job? Something you would just LOVE to do. I just know thats something I want to do. I know I’d be good at it. If you enjoying doing something, you’ll do it well. My idea is if I learn Chinese that goal will become more achievable. I suppose thats the main reason for learning Chinese. I’m not saying teaching English isn’t a good job, its just not something I want to do. I’m not passionate about it. Anybody can teach English, especially in China. People who speak terrible English can get a job here. So, focus myself on Chinese, then hopefully do something in that field of work. I hope that will apply to me some day. Why I wouldn’t like to grow up in China. 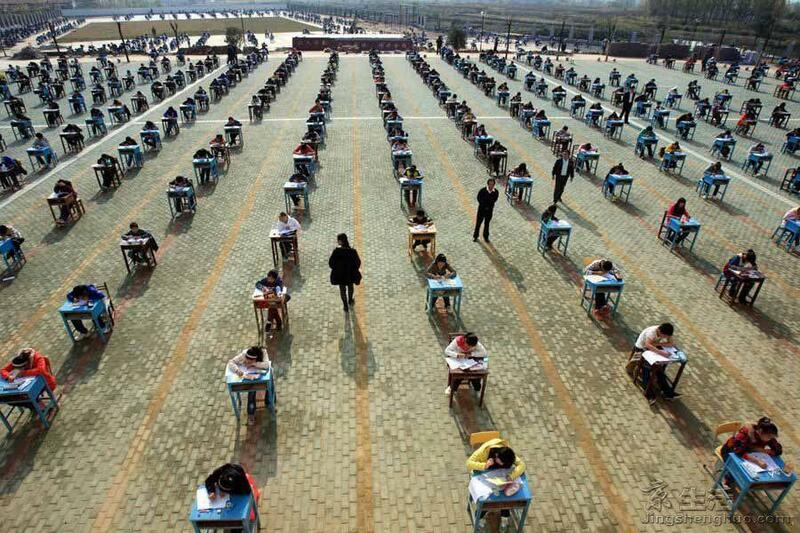 Chinese students during an exam.. outside! From my teaching of students with rather well off parents, I’ve come to notice that many of my students either are learning to play an instrument, going to dance classes, gymnastics classes, and of course joining me for English class. When I ask my students ‘what did you do last week?’ Most, if not all of them say ‘homework’. They receive tonnes of homework from their teachers. I ask my students do you play an instrument, most of them say yes, and it’s usually the piano. Because they’re like what, 1.4 billion people in China? The amount of competition between them must be fierce. From a young age they need to drum the Chinese phonics and characters into them, writing and writing the same characters for homework. This is when they are like 6 years old. Add to the fact that the Chinese are notorious at being good at Maths. Same as Mandarin, having started studying at a very young age. Aside from school, the parents send them off to learn something else like English or learning an instrument. With English though, I have to admit it is good to teach their child another language like English. When they are teens, they have countless exams, pages of homework, and such a big pressure to do well in school. Get good results in English so they can study abroad. In China, you can’t just be average, you can’t just ‘do your best’. You need to excel at everything, or else you’re not going to get anywhere in life, well, in China anyway. One of my teenagers told me that she has to do a physical examination so she can go into the next year. I was shocked! I asked her what she has to do; running, jumping, push-ups, ab toning and more. Apparently the government wants them to be healthy, but come on?? An exam on your fitness?? She said she has been practicing her push-ups and ab excursuses every night, 50 times…. her exam is next year. To me this is mad. Ha, and the thing is, no one in China is overweight! So these are the reasons why I wouldn’t like to grow up in China. To be honest I was average at school, meaning I would have been literally stressed to the max if I’d have lived in China. I’m quite happy I grew up in Ireland!